More than a third of the world’s bullion supply usually comes from recycled metal, but purchases at pawn shops and cash-for-gold companies had slowed during a three-year slump in the market. That’s all changed. With prices headed for their biggest annual gain since 2010, more people are unloading old treasures, recyclers are expanding capacity and some jewelers are seeing their businesses transformed. Almost all the gold ever mined is still around in one form or another, so recycling everything from jewelry to electronic circuit boards has been a key source of supply. Prices remain the biggest influence on the scrap industry. 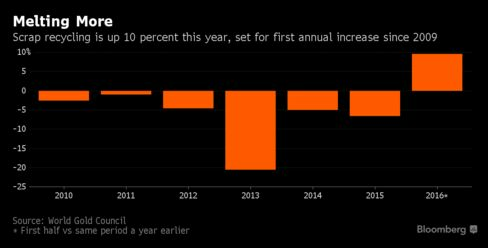 When bullion tumbled as much as 45 percent from a record in 2011, the amount melted at refineries fell, reaching an eight-year low in 2015, World Gold Council data show. But in the first six months of the year, recycling is up about 10 percent from the same period in 2015, heading for the first annual increase since 2009, Gold Council data show. Prices have jumped 26 percent in 2016, touching a two-year high of $1,375.34 an ounce in July, and had their biggest first-half rally since 1974. Bullion traded at $1,338 on Tuesday. 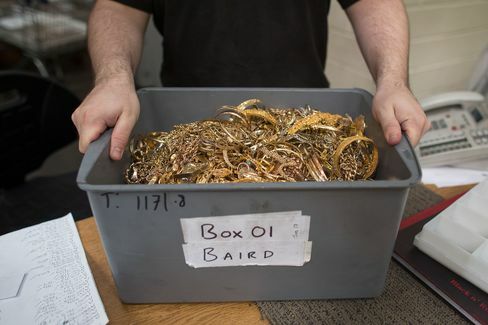 Baird & Co., which buys much of the U.K.’s scrap gold from collectors and pawn shops, is planning a 50 percent expansion at its 20-ton-a-year refining plant, which is near the London 2012 Olympic village. A stronger dollar, used in most bullion transactions, has made selling gold more attractive in countries where currencies have weakened, including the U.K., where voters in June elected to quit the European Union. That referendum pushed locally-priced metal above 1,000 pounds an ounce to the highest level in three years. In South Africa, one of the world’s top producers, prices touched an all-time high in the local currency in June. For European coin dealer CoinInvest.com, buybacks doubled as a share of sales since the so-called Brexit vote on June 23.